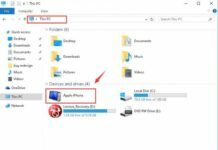 In the year 2009, when I got my first iPhone 3GS, it was time for me to move contacts from my Nokia phone to my iPhone 3GS (Tutorial here) for which I discussed two options – Syncing through outlook and transferring through SIM. Both methods worked well for me and it has helped many users whom I have shared this tutorial with. Now with the fast changing landscape of the Mobile Phone market, Android smartphones such as OnePlus phones, Samsung have taken a huge market share with many manufacturers making these phones at very affordable price points for the low end phones to very high end phones too. In this article, I will share an easy to use method to move, sync or transfer your phone contacts from iPhone to Android, or Android to iPhone very easily. Who Needs Move Contacts Between iPhone and Android? If you have an iPhone and you want to switch to an Android Phone, alternatively, you have and Android phone and you want to switch to an iPhone. 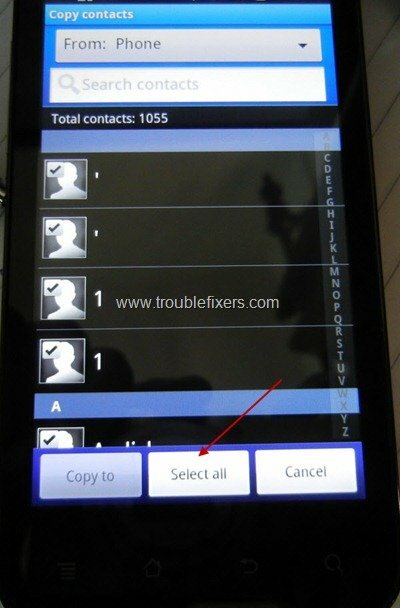 In a third case, some users may have an Android or iPhone and he/she wants to buy another iPhone or Android phone, then this tutorial will come very handy for you and save you form the pain to manually saving contacts to transferring contacts though other lengthy procedures. Before you proceed to the tutorial here are some basic needs for you to use this tutorial- you will need a computer (either PC or MAC), Internet Connection, Gmail or Google account, iPhone and its data cable and an Android Phone. 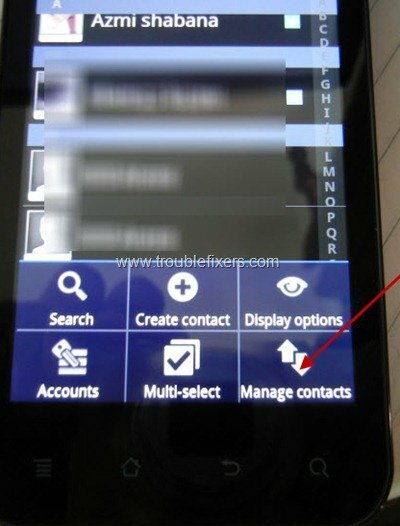 How To Move or Copy Contacts On iPhone To Android Phone? If you are an iPhone user and you are moving to an android phone, you need to follow below steps to easily sync your iPhone contacts with your Android Phone. Step 1: Download and Install latest version of iTunes on your Windows PC or MAC on which you sync your iPhone. If you have never synced your iPhone with a PC or MAC before, simply download the latest version of iTunes software on your computer. Step 2: Connect your iPhone to computer using the USB data cable and run the iTunes software. Your iTunes software will automatically detect the iPhone and show it on iTunes window and will automatically sync your iPhone if you have previously synced it with this computer, let the sync process complete. On the left hand side pane of the iTunes Window, click on your iPhone name, then click on Info link at the top horizontal men bar in the phone info. 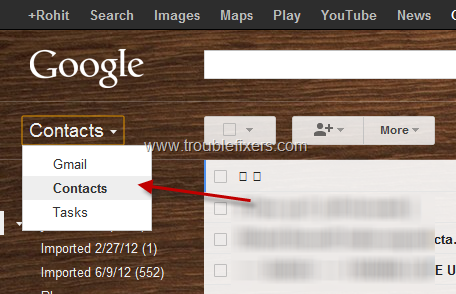 If the Sync Contacts with option is not checked, check the same and from dropdown menu, select Google Contacts. Step 3: After you change the contact preference to Google Contacts (don’t need to follow step 2 if it was already Google Contacts), type in with your Gmail username and password in the configuration windows on the iTunes which will pop up next. 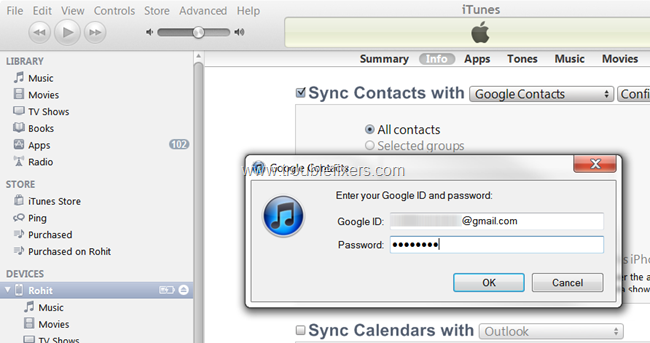 Step 4: IMPORTANT – This is the most important part, when you select a different service to sync the contact with(in this case Google), iTunes will ask whether to Replace or Merge the contacts on the iPhone. 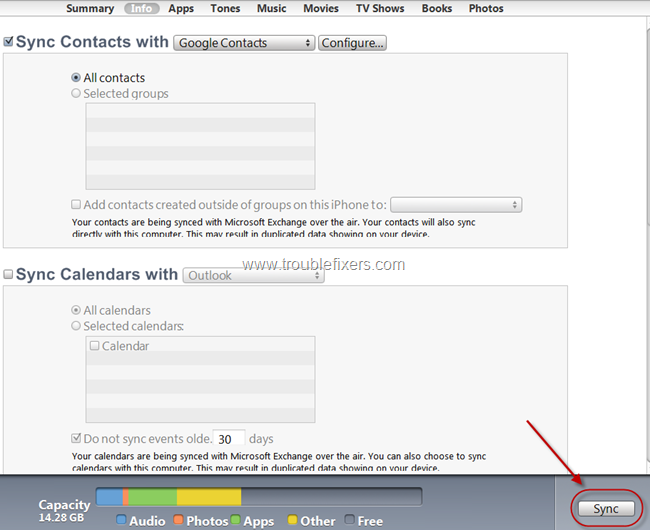 You must select Merge, else it will erase contacts on your iPhone. 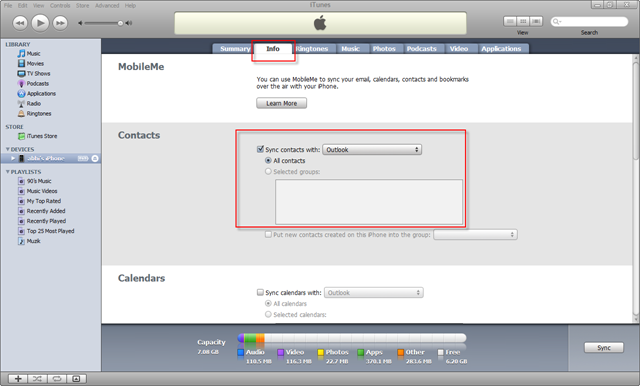 Step 5: Sync your iPhone by clicking Sync at the bottom right corner of the iTunes Info screen. This will save your iPhone contact to your Gmail account Contacts section. To verify the same, after the Sync is complete, sig into your Gmail account and browser through your Gmail’s Imported contacts and verify whether all contacts on your iPhone appear there or not. Step 6: After your contacts are Synced with Gmail or Google contacts, sign into your android phone using the same Gmail id. Make sure that the Android phone is connected to Internet (using Wifi or 3G or EDGE) and able to access Gmail. After few minutes you will see all the Gmail contacts Synced with your Android Phone in the phonebook or contacts by default. If it does not happen automatically (rare chance), go to accounts settings and turn on the sync option for your Gmail account (the same account you used in step 3 above). This is it, you now have all your contacts from your iPhone in your Gmail account as well as android phone. 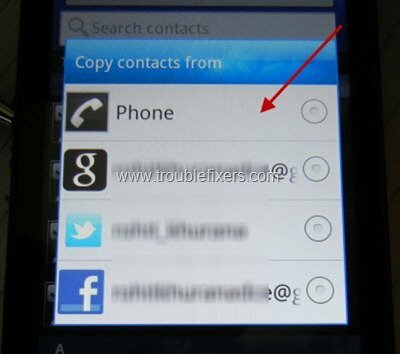 How To Move or Copy Contacts On Android To iPhone? 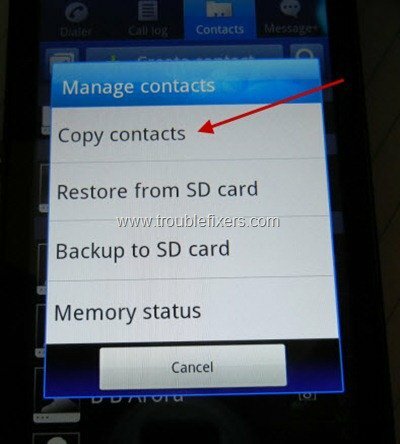 Step 1: If you have been using the android phone for quite sometime, it is possible that you may have saved some of the contacts on Phone memory or SIM card etc. First of all we need to copy these contacts to your Gmail account. For the same, open contacts on your Android phone, select the Menu > Manage Contacts > Copy Contacts > From Phone and select all the contacts you want to move or copy and these to your Gmail account. Repeat this for any SIM contacts, twitter and Facebook contacts too if any. This will copy the selected contacts from your Android phone to your Gmail account. It may take some minutes depending on the number of contacts to copy. Wait for a few minutes and then login into your Gmail account from your computer to verify that the phone contacts has been copied there. 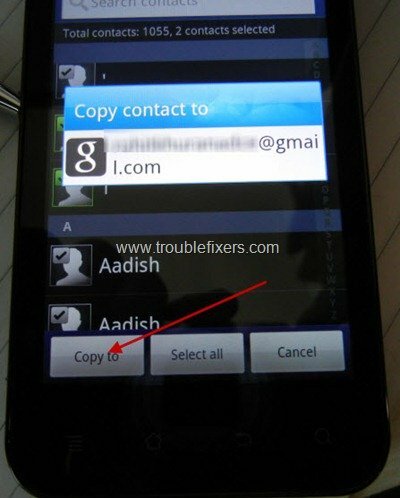 Step 2: After your have copied all the contacts from the Android phone to Gmail, follow the above tutorial of – How To Move or Copy Contacts On iPhone To Android Phone from Step 1 to Step 5. 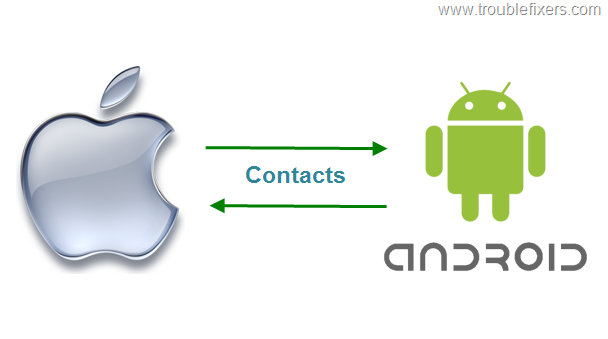 How To Sync Contacts Between iPhone And Android Phone? In case you plan to use both iPhone and Android phone, you first need to set up the contacts sync in iTunes with Google contacts, for the same, you need to follow the above tutorial on How To Move or Copy Contacts On iPhone To Android Phone from Step 1 to Step 5. 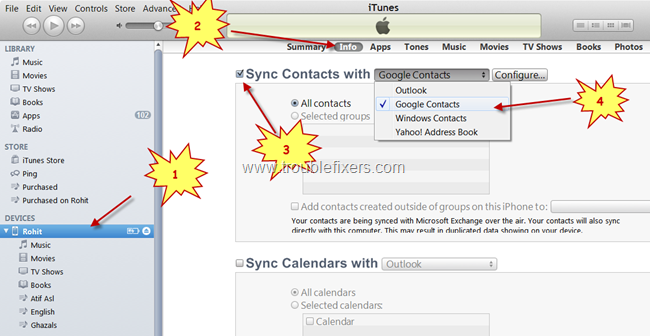 After you follow the above steps, all your contacts will be synced between iPhone, Gmail and Android. Next thing you need to keep in mind is that you need to save your new contacts on your Android phone in Gmail contacts, this will keep the contacts online on Gmail always and then you need to keep your iPhone synced with iTunes frequently (say once a week). In this case, whatever new contacts you crease using your iPhone will be saved to your Google contacts, whatever new contacts you create on Android will be saved to Google contacts, and these will be synced with each other automatically on the Android phone and manually when your sync your iPhone with iTunes on your computer. There are some free and paid apps which allow the same, but they can not be fully relied on as there maybe some fields which get missing while contacts transfer etc. so the above tutorial of using the official software and services is both free and reliable. I hope you find the above three tutorials useful and easy to follow. If you have any suggestions on comments, please share through the comments below. You can check out more iPhone related tips and tutorial here. Thank you for this very helpful step-by-step instructions. With a technology idiot like me? This worth heaps!